Today represents the fifth time in eight games this season that Giant Stephen Coniglio has reached 30 disposals. Currently on 32, he is slightly short of his seasons best of 34, achieved against Port Adelaide in Round 4. Greater Western Sydney has conceded just 261 effective disposals per game this season, ranked fourth in the league. They are on track for a similar result today, as the Dogs currently stand at 256. The Giants themselves have 289 effective disposals. Dale Morris of the Western Bulldogs is the only player in today's game to have spent 100 per cent of the match on the ground. In the past four weeks, the Dogs have won 29 more contested possessions per game than their opposition, best in the AFL. While they are again leading their opponents in this category today, 121 to 111, it has not been reflected on the scoreboard. Heath Shaw is now leading all players with 30 disposals at an outstanding 97 per cent efficiency. He also has more marks than anyone else with ten. Callan Ward has averaged just 17 disposals against his former side in the Bulldogs, his lowest return against any side. However he has broken these shackles and has 23 already today with much of the final term still to play. Heath Shaw has been responsible for 12 of the Giants rebound 50s. 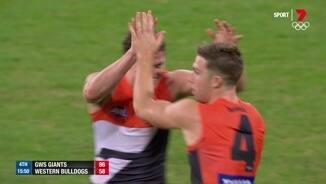 Next most on the ground is his GWS teammate Nick Haynes with four. No player on the ground has more spoils than Bulldog Fletcher Roberts with seven. However, only one of these spoils has gone to the direct advantage of a teammate. Prior to this week, the Bulldogs were averaging 19 more inside 50s per game than their opposition this season, the best in the AFL. 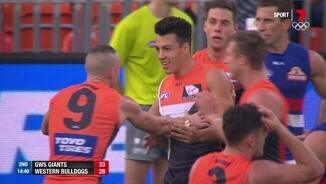 The ledger in today's game currently currently has both the Dogs and Giants with 32 each. Western Bulldogs defenders Dale Morris and Easton Wood lead all players on the ground with three intercept marks each. The best for the Giants are Rory Lobb and Nick Haynes with two apiece. With his twentieth goal in his ninth game for the club, Steve Johnson continues his streak of kicking a major in every game for GWS. 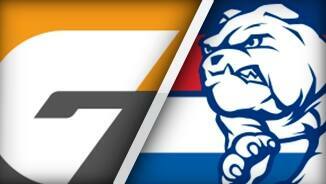 The Dogs have the last nine inside 50s, dating back to the 25 minute mark of the second term. The Bulldogs have not won a clearance in almost 20 minutes. Tom Liberatore applied 19 tackles last week against the Demons, the equalmost ever recorded by Champion Data and four more than any other Bulldogs player has ever recorded. He has only two so far today. The Giants have nine of the last ten clearances, and six of the last eight inside 50s, yet the Western Bulldogs have the last two goals. 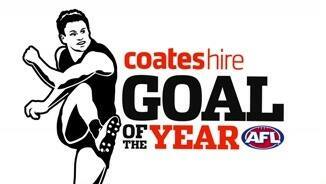 Rhys Palmer of GWS is averaging a careerbest 1.7 goals per game in 2016. The second quarter free kick count favours the Western Bulldogs five to one, after both teams received four frees each in the first term. Jeremy Cameron has 20 goals from just 35 kicks in his five AFL games for 2016. 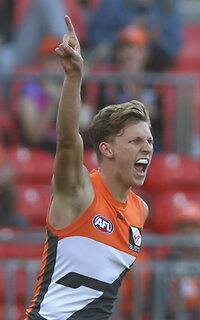 GWS recruit Jacob Hopper recorded 32 disposals, nine clearances and seven inside 50s on debut last week. He is having a quieter game thus far today, with just the three disposals and two clearances. All three Western Bulldogs goals have come from a distance of less than 15 metres. The Giants Stephen Coniglio leads all players on the ground with nine disposals. However, he is getting rid of the ball at just 44 per cent. This is well down on his season average of 69 per cent. Giants InterchangeTim Mohr and is possibly out for the game. Jordan Roughead is averaging four tackles per game for the Bulldogs this year, the best return in his seven year career. He already has laid four first term tackles today. The Western Bulldogs have the last three clearances, and five of the last six inside 50s. Luke Dahlhaus finished with 29 disposals and two goals when he last faced the Giants in Round 9 last season. He has just the two first quarter disposals so far today. The Dogs have been inside their forward 50 five times for just the solitary rushed behind. This compares to the Giants' six forays inside 50 for 3.2. 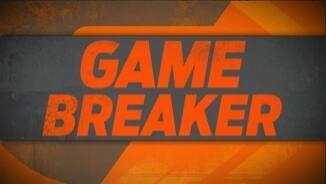 Giants InterchangeMatt Buntine and is possibly out for the game. 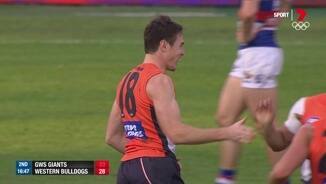 The opening goal of the game gives Giant Jeremy Cameron 17.3 so far this season, a conversion rate of 85 per cent. The Giants are averaging 114 points per game this season, to lead the competition. The Bulldogs are best when it comes to receiving free kicks. They lead the league with an average of 23 per game. Welcome to Spotless Stadium for the GWS Giants v Western Bulldogs Round 9 clash. GREATER Western Sydney has shrugged off the early loss of two defenders to outclass the Western Bulldogs by 25 points at Spotless Stadium on Sunday. Led brilliantly by hard-nosed co-captain Callan Ward, defender Heath Shaw and star forward Jeremy Cameron, who kicked five goals, the 15.8 (98) to 10.13 (73) victory consolidated the Giants' spot in the top four. The home side lost Matt Buntine (concussion) and Tim Mohr (hamstring) in the opening term, with Bulldogs midfielder Lin Jong likely to come under scrutiny from the Match Review Panel for his bump on Buntine. But it mattered little as Ward, Stephen Coniglio, Tom Scully and Dylan Shiel capitalised on the dominance of ruckman Shane Mumford to set up the comfortable win. Shaw continued his stellar season to finish the game with an incredible game-high 38 possessions – 36 of them kicks, which were all effective - while the returning Toby Greene kicked three goals to go with his 22 possessions. 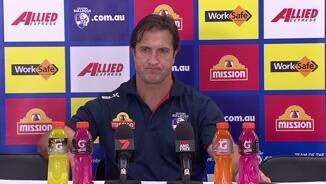 Coach Leon Cameron was pleased with the gutsy performance from his side. "Losing players early always makes it a bit tougher," he said. 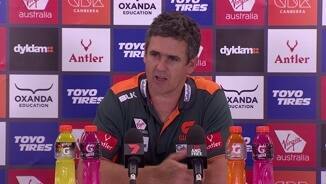 "We seem to have a knack of losing key defenders in the last couple of years and it is disappointing, but the guys had to dig in and play a bit smarter. "It is what it is, that's what happens, everyone puts up with injuries." Marcus Bontempelli, Luke Dahlhaus and veteran backman Dale Morris tried hard for the visitors but the Bulldogs failed to have any clear winners on a bad day for the club in Sydney. Coach Luke Beveridge said the Dogs tried a few different things in an effort to stop the Giants' momentum but nothing seemed to work. 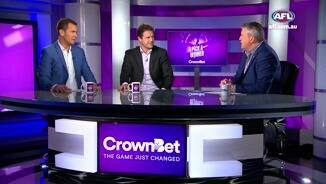 "We just at no stage could get any momentum on the scoreboard ourselves to really threaten," he said. "I didn't feel like there was a point in the game where we couldn't and even with six minutes to go there was only four goals in it and I still felt like we were a chance. "All in all we were a bit messy with the ball and their sort of star quality forwards, particularly Jeremy Cameron, got the better of us. "We were a bit disappointed in all of that." The Giants piled on three quick goals to start the game and led by 20 points when Cameron kicked his second, but the Bulldogs midfield worked hard to regain the ascendancy and they booted three of the next four goals to trail by just five points at the first break. A questionable free kick helped Jake Stringer get the visitors on the board first after quarter-time, but Cameron's fourth triggered a five-goal burst in just eight minutes and GWS threatened to blow the game open in the second term. With Ward inspirational at the contest and Dylan Shiel and Tom Scully powerful on the spread the Giants' lead jumped to 29 points, but a long bomb from ruckman Tom Campbell and another for Mitch Wallis halted the home side's momentum again, and reduced the GWS lead to 17 points at half-time. 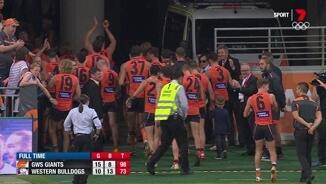 Despite being two men down, it was the Giants who surged in the third term, with the Bulldogs' disposal by foot constantly handing the footy back to their opposition, who ran harder and wanted to win the one-on-one contests more than the visitors. 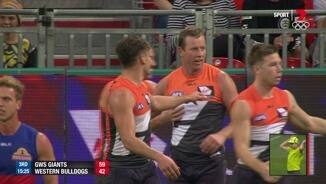 Four goals to one for GWS – including two pieces of individual brilliance from Steve Johnson – virtually ended any hope of a Bulldogs comeback, with Coniglio, Ward, Shiel and Shaw rampant for the leaders. Greater Western Sydney: The Giants will be sweating on Matt Buntine's availability next week after he left the ground and failed to return from a head knock in the first term. Luckless key defender Tim Mohr (hamstring) also missed most of the match. 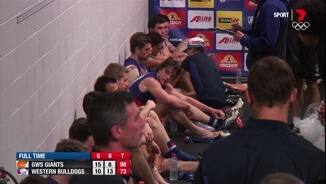 Western Bulldogs: The Dogs appear to have emerged unscathed. The Giants head to Adelaide for a big clash with the Crows on Saturday night, while the Bulldogs get an eight-day break before they take on Collingwood at the MCG on Sunday afternoon. 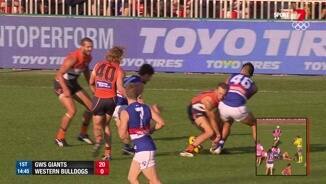 Reports: Lin Jong (Bulldogs) for forceful front-on contact on Matt Buntine (Giants) in the first quarter.